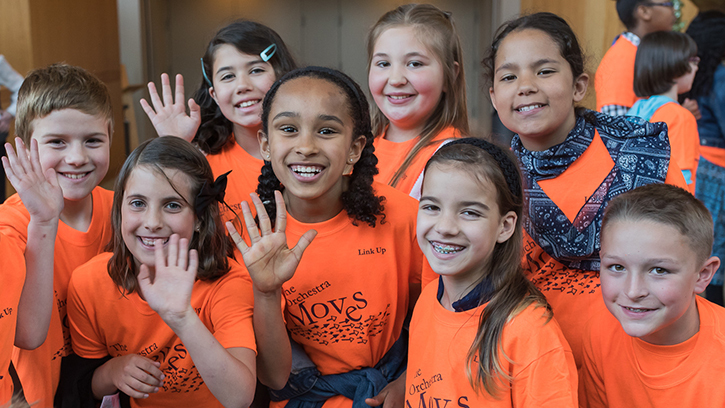 Over 10,000 students visited Benaroya Hall this year to play and sing with the Seattle Symphony as part of Link Up, a program for students in grades 3–5. The familiar yellow school buses line the streets of downtown Seattle, each one emblazoned with the name of a different school district. The streets around Benaroya Hall are filled with elementary students instead of the familiar bustle of the downtown business crowd. It must be time for Link Up! Over 10,000 students and teachers from 107 elementary schools visited the Seattle Symphony this May for Link Up, the Symphony’s elementary school music program for grades 3–5. The culminating concert invites students from around the Puget Sound region, often their first time to Benaroya Hall, to sing and play recorder from their seats along with the orchestra. The Seattle Symphony is proud community partners with Seattle Public Schools’ Creative Advantage Program and the Highline School District, which has committed their entire fourth grade to coming to Link Up. The concert at Benaroya Hall is only one part of the program. Throughout the year, Teaching Artists from the Seattle Symphony visit classrooms as part of the residency program, which can run for 5, 10 or 20 weeks, depending on the needs of the classroom teachers. The program complements existing music programs and activates programs at schools without a music specialist. For many students, it will be their first experience learning to play an instrument. The Symphony intends to increase the students served from 10,000 to 12,000 during the 2016–2017 season. Link Up is a national program of New York’s Carnegie Hall Weill Music Institute, which developed and provides the curriculum, teacher guides and student workbooks at no cost to 80 partner orchestras around the world. Since becoming a Link Up national partner during the 2012–2013 season, the Symphony has welcomed over 27,000 students to join the orchestra for a morning of playing music. Thank you to each and every supporter of the Seattle Symphony. Your gift today helps make Link Up a reality!